And another Rydal week comes to an end! The weather was a hot topic this year, as usual. Not in the literal sense, of course, although the previous 5 weeks had seen record-breaking temperatures all over the UK. This Rydal’s weather was a real mixed bag: plenty of rain, but some genuinely warm afternoons too. Some people even used sun cream! We had a few new members who came along, and I hope they were made to feel very welcome (our youngest first-timer was 8 weeks old!). The repertoire (here) was as varied as ever, ranging from Farnon’s ‘Jumping Bean March’ to Beethoven 9. No Mahler though. The legendary Friday night quiz was won by ‘Poppy and Her Human Admirers’ – but only just. Having been docked a point right at the start for insubordination, they had to rely on winning the final tie-break question – to do with knowing the height of Helvellyn (950m). Lucky for them, as in an earlier round they had already lost a ‘floss-off’ against the team that eventually came second. Jayne kept her unbeaten record intact, by staying out of the quiz altogether. The same can’t be said for Ben, though. Sincere thanks to everyone who contributed to this year’s course – Jane our administrator, Leo our conductor, our soloists, all playing members, non-playing friends and family, the Rydal Hall staff, and everyone who came in to listen. We’ll be sending out a survey in next week or so, while it’s fresh in the memory, to get everyone’s opinions on various aspects of the course. This is your chance to say what you think, so don’t hold back! Now is also a good time to start thinking about next year’s Rydal, which starts on Saturday 27th July 2019 and finishes on Saturday 3rd August 2019. Spread the word if you know anyone who might be interested in coming along. *2018 wasn’t necessarily the best year ever, just the most recent. All previous years have also been the best ever. 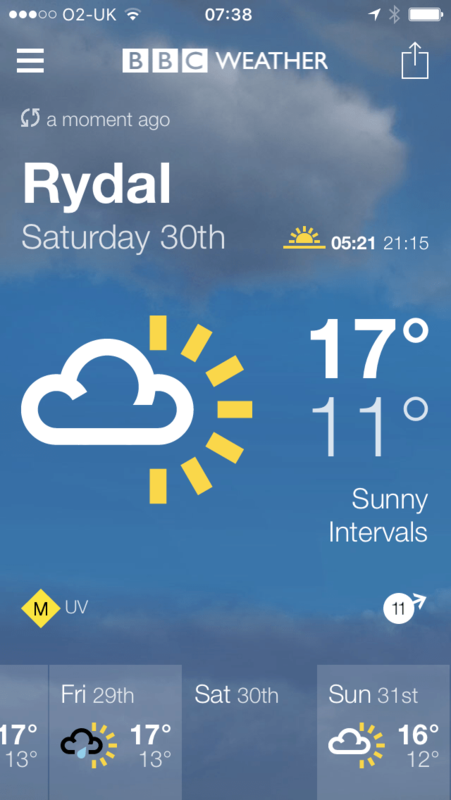 Spring has definitely sprung, and Rydal 2018 is only 16 weeks away! Here’s a copy of the letter that was sent to all orchestra members recently. If you’re not already a member but you’re interested in coming along this year, read through these details and then get in touch. Happy New Year! It’s time to banish those winter blues and look forward to the last Saturday in July, when we will meet once again for the 63rd year of the Genin Orchestra. The dates for your diary are Saturday 28th July to Saturday 4th August 2018. Full board £665 Includes bed, breakfast, 2 course lunch, 3 course evening meal and morning coffee. Dinner, bed and breakfast £565 Includes bed, breakfast, 3 course evening meal and morning coffee. Non-residential – orchestra only £126 for the week Includes morning coffee. Children under 5 are free. For children aged 5 to 9 the cost is 40% of the full price, and for children aged 10 to 14 it is 60%. Deposit by 31st March 2018. For residents this is £100, for non-residents £25. Full balance by 30th June 2018. I have reserved the full hall for the Genin Orchestra, but any rooms which we have not filled will be released back to the hall on at the end of April 2018. So please reserve your place as soon as possible, to avoid disappointment. As usual, you can spread the cost over the next few months in any way you like, just as long as you let me know. Also, when you send you deposit, state which option you have chosen so that I can ensure the meal numbers are correct. You can pay online, by standing order, or by cheque. If you haven’t been to Rydal Hall before, we rehearse in the Bishop Bulley barn, which is around 100 metres away from the main building. The path to the barn is uneven, and there is a flight of stairs to reach the barn. Thank you for making 2017 such a successful year. I am looking forward to 2018 being even better than ever! The hail that was forecast on Thursday morning did NOT materialise, but the sun that was promised for Friday did make a brief – and very welcome – appearance. Some new members joined us this year, and appeared to enjoy themselves! We had strength in depth in each string section, and exactly the right number of woodwind players – plus a full percussion department. There was a solid brass team, as usual, although we anticipate needing an extra trumpet and trombone for next year, so spread the word. So now it’s back to real life, and the countdown to Rydal 2018. Thank you to every single person who contributed to this year’s course – our administrator, our conductor, our soloists, playing members, non-playing friends and family, passers-by who came in to listen, the staff of Rydal Hall, plus two very friendly dogs. *Please send any photos (of any activities, not just outdoor) that you’re happy for us to publish, and we’ll put them up on the website. **Could this possibly be because they had more players than any other team? Note to the Quizmaster: some refinement of the rules might be in order for next year. There are only a few more days to go until we meet again at Rydal Hall, and there are a couple of final details to tell you about. Firstly, for those who are staying in the hall, the timing for the evening meal has moved to a slightly earlier time of 6pm. This is to make sure that there is plenty of time for the full three courses to be consumed in a leisurely manner without having to rush off for the rehearsal. Also, we have asked the staff at the hall to ensure that all the lights in the barn are working and positioned correctly, but if you have stand lights you might want to bring them along. It’s eight and a half weeks to go until we all meet at Rydal Hall on 29th July! Here are some final details. Please arrive during the afternoon of Saturday 29th July. For those staying in Rydal Hall, you will be able to come in from 4pm, and tea and cake will be served in the entrance hall. I will be in the hall to meet you from 4 o’clock in the afternoon. The first evening meal will be at 6.30pm. I will need to send the final payment to Rydal Hall by the 8th July at the latest, so if you haven’t paid in full yet then please do so as soon as you can. If you have any difficulties with this date then please just let me know. I’m looking forward to seeing you again on 29th July for another wonderful week! The days may be getting longer, but the time between now and Rydal 2017 is getting shorter! If you are already booked in, then you should by now have received the letter below. If you’re still thinking about it, then you should read it for information about payment dates etc. And then get those skates on! Here are the details for the 62nd year of the Genin Orchestra, which will take place from Saturday 29th July to Saturday 5th August 2017. Rydal Hall have increased their prices slightly from last year. This is the first time we have increased the cost of full board since 2014. The price options are shown in the table below. £365 (9 to 14) Includes bed, breakfast, 2 course lunch, 3 course evening meal and morning coffee and cake and includes afternoon tea. £350 (9 to 14) Includes bed, breakfast, 2 course lunch, 3 course evening meal and morning coffee and cake excluding afternoon tea. £305 (9 to 14) Includes bed, breakfast, 3 course evening meal and morning coffee. Following some confusion last year, I have checked with the hall and afternoon tea definitely comes with cake! Deposit by 31st March 2017. For residents this is £100, for non-residents £25. Full balance by 30th June 2017. I have reserved 22 rooms for the Genin Orchestra, but any rooms which we have not filled will be released back to the hall on at the end of April 2017. This means that if I receive enquiries from orchestra members after 30th April it will no longer be in my hands, and will depend on whether the hall has any rooms left. Thank you for making 2016 such a successful year. I am looking forward to 2017 being even better than ever! Exactly 6 months to go! It’s 29th January, and there are exactly six months to go before Rydal 2017! If you’re thinking about coming along, then now is the time to let us know. About something but he wouldn’t tell me. That his music was casually racist. 2016 – another vintage year! What a brilliant week that was! The weather started off well, descended into wintry gloom by mid-week, but recovered itself by Thursday evening to give us one of the best final days in years. The music was just as varied, and we made full use of our newly enlarged brass section via Mahler, Mussorgsky, and Ketèlbey, among many others. The new ‘higher-lower’ round in the quiz was an instant hit, and the result was in the balance until the very last minute, when ‘Mahler Flounce’ pipped the other teams to the winning post with their double limerick sung to the tune of ‘Ding Dong Merrily on High’. We had a few new members join us this year and I hope that they all felt welcome. I also hope that they want to come back in 2017! A word of caution – we do expect to be quite full up, so get your reservation in early. We can usually accommodate one or two more brass and string players though. We’ll publish some photos and other observations here in the coming weeks, as well as the list of music played. Feel free to send any pictures in if you want the world to see them. In the meantime – keep practising. You have 51 weeks!